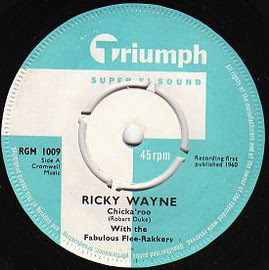 Here's a real obscurity, a previously unreleased gem from the Joe Meek stable, Muscles by Ricky Wayne. Ricky Wayne was body builder who later became Mister Universe. He couldn't sing, but to Joe Meek that was never a reason to stop the tapes rolling. Joe issued a 45 by Ricky on his Triumph label (backed by his house band the Fabulous Flee-Rakkers), but this cut - along with several others which have since turned up on compilations - didn't (ahem) make the cut. Apparently Joe, who as we all know had his biggest hit with Telstar by the Tornados (the first record by a British group to top the American singles charts) but eventually committed suicide after being unable to come to terms with his homosexuality and sliding into depression, alcoholism and violent mood swings, rehearsed a stage show with Ricky, which climaxed in a striptease - some thirty five years before the Full Monty. Wayne, who also co-presented Joe Meek's weekly slots on radio Caroline in the early 60s, was born Learie Carasco in St Lucia, but emigrated to England in 1960. After his brush with Meek - as Rick Wayne - he wrote numerous articles and books on bodybuilding before becoming interested in politics. He moved back to St. Lucia (where he still resides) and founded the St. Lucia Star and She Caribbean with his wife, former US bodybuilder Mae Mollica Sabbagh. Wayne even served as an opposition party Senator until 1998 when he was removed by then Prime Minister Kenny Anthony for his opposition of a government bailout of the failing St. Lucian airline. Our hero now hosts a politically-charged television talk show, where he is known for aggressive interviews and fiery comments. A far cry from this drivel. A reader of this blog, who rather wisely chose to remain anonymous, asked after the previous post: "Why couldn't we get 'Dig Me A Hole' as well? This is important stuff. We demand action!" Fair enough. Although it's nowhere near as good, you asked for it so here it is. Sung by Kay Weaver, Dig Me A Hole was written by one Bill Van Gundy, and recorded (as was I'm the Cat) in mid 1977. 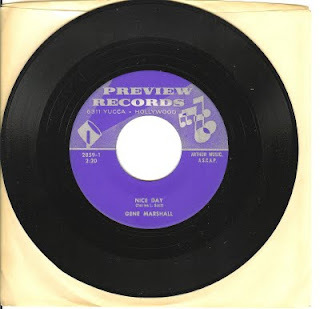 I recently picked up, thanks to a dealer in the States, a pile of song-poem 45s from the late 70s-early 80s that had originally belonged to US radio station WCPC, a Christian broadcasting service based in Mississippi. With a huge proportion of song-poems little more than paeans to God, it's not surprising that a low rent outfit with meagre income would resort to filling their library with music they would not need to pay royalties on, but goodness knows what the good listeners in Tupelo would have made of I'm The Cat. 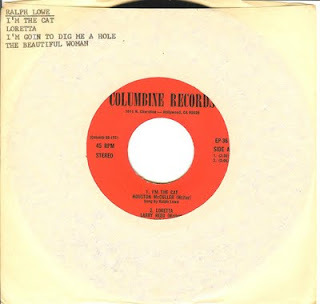 It's performed by Ralph Lowe, one of the stars of the Columbine stable and, along with label mates Kay Weaver and John Muir (aka Gene Merlino) the singer of literally hundreds (quite possibly thousands) of song poems during his long and eventful career. The wondrous Ralph is also the voice behind such sing-poem classics as Jimmy Carter Says Yes, Disco Dancer You're The Answer, Stop In And Howdy With Me and the brilliantly-titled Grow Up And Go Away. I had to share this with you. It's everything a song-poem should be. Insane delivery, insane lyrics and a brilliantly wrong backing. Oh, and a spoken word passage, which in my book is always a bonus. Christian music is world full of weirdness: tons of utterly peculiar releases, as we have seen earlier with L'il Markie. But nothing can prepare you for the bizarre sub-genre of Christian ventriloquism. I've never been able to get my head around the idea of a puppet singing on a record. Sure, there's an art of sorts to keeping your lips from moving while you've got your hand up a doll's arse but what might work as a novelty on the live stage is a bit lost when you don't actually need the dummy. It's just a fool in a studio putting on a stupid voice. There are loads of them though: the utterly scary Geraldine and Ricky; Don and Seymour; the Christian Astronauts (honestly - get Googling) and the biggest and most prolific of them all Little Marcy. Marcy Tigner studied piano and trombone as a child, eventually releasing two trombone LPs under her own name. The committed Cristian was determined to exploit her art to praise God, but apparently there's not a huge market for God bothering trombonists. 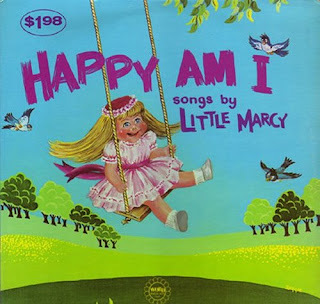 Undeterred, she hooked up with a small wooden doll, which she christened Little Marcy and, with the gift of her unusual, child-like singing voice, over three decades released around three dozen dopey, odd or downright disturbing albums. This unusual act has been fascinating, inspiring and repelling audiences since the 1960s; the pair appeared on radio programs such as Marcy Tigner's Hymntime and Sing with Marcy, there's a TV special with Smokey the Bear (and, naturellement, an accompanying album) and at least two Little Marcy films. Honestly! Hopeless...although not that far off some of the rubbish spouted by Marc Bolan now feted as art. Gene Marshall is one of the biggest ‘stars’ of the song-poem industry. A man who has sung on literally thousands of recordings for companies such as Preview and Columbine (as John Muir), under his own name - Gene Merlino - he’s a successful studio singer who has won Grammys, worked with Sinatra and Presley and has even appeared on a brace of Simpsons episodes. Merlino has had a long association with Hollywood, singing in movies including The Little Mermaid and Beauty and the Beast as well as singing the part of Lancelot in the film version of Camelot. He has coached Bette Midler, has recorded with – among literally hundreds of others - Barbra Streisand, Ray Conniff, Natalie Cole and Elvis (also appearing in Presley’s 1969 film The Trouble With Girls), was narrator on Rod McKewen’s album The Sky and appeared widely on prime time US TV shows including Sonny & Cher and The Smothers Brothers. His biggest claim to immortality is for holding the record for most songs sung in a single session. Merlino claims to have sung 55 separate songs in a four-hour session back in '69, recording what he always refers to as ‘demos’, for a company (probably Preview) that specialised in song-poems. Merlino estimates that he sang about 10,000 song-poems during the 35 years he was in the business, earning little more than a few dollars a song. Yet his work has become widely sought after in record collecting circles, with several of his recordings appearing on song-poem compilations.